Femulate: If you can’t stand the heat, then put on a sundress! If you can’t stand the heat, then put on a sundress! It has been hot and humid in Downtown Femulation City lately. High temperatures and worse, high humidity makes life in a wig uncomfortable! Thank Goddess for air conditioning! It was so hot one day that the missus suggested that I put on a sundress. She must have been joking because she knows darn well that I do not own a sundress. On the other hand, with the air-conditioner cranking away at full blast, I could have dressed to the nines and lounged around the house the rest of the day. 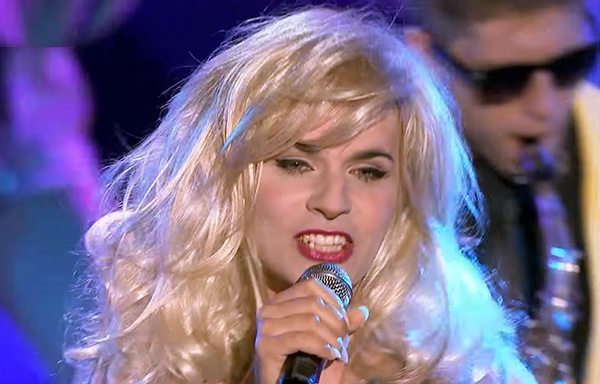 Kuba Molęda femulating on the Polish version of television's Your Face Sounds Familiar. It's time you bought a sundress!!!!! Buy a sundress - and a hat. Sitting in a garden en femme is one of life's simple pleasures! I wear sundresses all the time around the house when it's hot. And I wear warm dresses around the house when it's cold. Stana, I agree with Marian. Get a sundress. Better yet, get several. I've found several places that have sundresses on sale. Many of the stores are running sales right now with many pretty colors and styles. A sundress is an essential of any girl's wardrobe, even if you only get a chance to wear it a couple of times a year it is invaluable.